It’s useful to examine past papers when you’re preparing to sit an exam. We’ve taken the hard work out for CII J02 exam candidates, and this article discusses both the April 2015 exam paper and the one for October 2014. 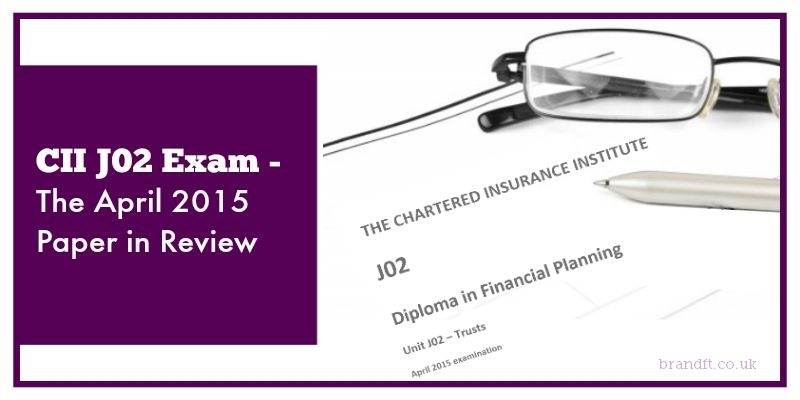 Next in line for our past paper analysis is J02, the exam which covers trusts. Two hours are given to answer 15 short answer questions for a total of 130 marks, and one thing you can be sure of is that there will be a question on bankruptcy, powers of attorney and wills. The rest is of course made up of the various technicalities surrounding the world of trusts. The April exam began with testing knowledge on beneficial interests, trust creation and essential elements and trustee’s considerations for a particular investment. All of these areas should not have caused too many problems. The next 3 questions covered powers of attorney, wills and debt relief orders. There was also a separate question specifically on the responsibilities of the official receiver and the trustee in bankruptcy. One question that did stand out was the one that tested knowledge on excluded property trusts for someone domiciled in France. This is an area not often tested and perhaps not something advisers bump into every day so may have caused a slight headache for some. It was worth 8 marks so not the end of the world if some moved swiftly on…to the next question which thankfully reverted to the more familiar territory of spousal bypass trusts and gave a comfortable 10 marks. Question 11 was made up part calculation and part theory with the calculation part having been tested many times before; the different IHT due if the settlor pays the tax on a chargeable lifetime transfer compared to the IHT due if the trustees paid the tax. With the end in sight, question 12 tested the taxation of trusts for vulnerable beneficiaries; question 13 was a dream of a question with part of it asking for the advantages of writing a life policy under trust. A slight curveball followed with 10 marks available for outlining the factors to consider when using a discounted gift trust for IHT planning – quite a lot of marks for a fairly basic product. But finally the last question which was on trust reviews which also tends to be a question that pops up somewhere in the exam paper so should have been an easy 8 marks to pick up at the end. Reading a review of April’s #CII #J02 Trusts exam. The expected questions on bankruptcy and powers of attorney were both in the paper, but the exam actually kicked off with a question on the responsibilities of executors with a further question later on which tested knowledge of how to deal with income and capital gains of a deceased’s estate. The review question came up quite early in this exam – so a nice early 9 marks in the bag for most. Question 3, 6 and 15 all tested different elements of trust law; perpetuity and accumulation periods, trustees’ statutory duty of care and the number of trustees needed for land as well as the circumstances where a trustee can be replaced. We hope the majority of the marks on offer here would have been achieved. There was then quite a flurry of questions all on discretionary trusts. Firstly the IHT implications of transferring an apartment into a discretionary trust (10 marks), then the income tax and CGT implications of transferring equities and finally a CGT calculation on a disposal of shares. A couple of the questions could have been challenging; having to distinguish a non-statutory trust from an enforceable contract for example as well as how a charitable trust differs from a private trust. These are things that you don’t come across often in real life so really had to have studied them to gain maximum marks. And finally a question on the taxation of a chargeable event on a bond written under trust and how to reduce any tax liability; this shouldn’t really have caused any problems for the well prepared student. If you’re studying for your CII J02 exam, and you’re looking for that extra advantage, grab our free taster to try out one of Brand Financial Training’s mock exam papers for yourself. Click the link to download the J02 mock exam taster now! Are you up to speed on bankruptcy, powers of attorney and wills? If you’re sitting in October, how do you think you’ll do?